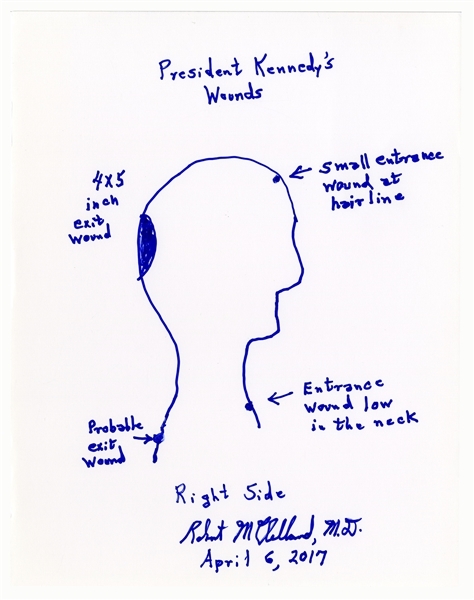 Signed drawing entitled ''President Kennedy's Wounds'', rendered by Dr. Robert McClelland, one of the physicians who attended to John F. Kennedy at Parkland Hospital after the President was shot. McClelland was the doctor responsible for holding the President's head as other surgeons tried to save his life, and was therefore in the unique position to see the extent of his head wounds. McClelland has stated that he ''absolutely'' believes there were two shooters, which his drawing suggests, and doesn't rule out the possibility of a government conspiracy to assassinate the President. With the right side of the head in profile, McClelland draws a large ''4x5 inch exit wound'' at the back of the head, with a corresponding ''Small entrance wound at hair line'' near the forehead. He also draws a bullet wound on the neck, differing from the Warren Commission report by stating that it's the ''Entrance wound low in the neck''; the Warren Commission stated that the bullet entered Kennedy's back and exited through the neck. McClelland signs the document, ''Robert N. McClelland, M.D. / April 6, 2017''. White sheet of paper composed in blue felt tip measures 8.5'' x 11''. Near fine condition.